UPDATE #6: There are still 8 spots left. You may claim a spot by arriving early with exact cash. Also, there are usually 6 no-shows for this event, so you just might be able to join us. Make sure to come early with exact cash. UPDATE #5: The email with my cell no. has been sent to the yes RSVPs. TEXT me if you need to (as my service goes in and out over there). If you do not see my email, check your spam folder, and also make sure your email and Meetup settings allow for you to always receive messages from the organizer. If it’s not there, send me a message through my Meetup profile with your cell no. See you there! UPDATE #4: Just a reminder, I’ll be the one with a red flag (1 foot x 1 foot in size) with the word “ACK” on it! At noon, I’ll check people in, we’ll fill out waivers, and have our provided lunch served… then we’ll be on our way! Don’t forget to account for traffic delays, and please be on time. Once we’re on the river, I WILL NOT have my cell phone on me! UPDATE #3: Just a reminder, per the event posting, the location is NOT online mappable or GPS-able. Please follow the directions in the “Directions” section of the event posting. An email with this UPDATE has been sent to the yes RSVPs. See you there! UPDATE #2: The early-bird price has ended and the ticket price is now $54. I look forward to seeing you there! UPDATE #1: There are fewer than 10 early bird spots left and the price will increase from $47 to $54 when the early bird spots are gone or by Sun. July 22nd (whichever comes first). To be fair to those who want to join in and are ready to make payment, I’ll be removing those that haven’t paid by Sun. July 15th. Make payment to lock in the early bird price and your spot (see the “Payment” section of the event posting). If you’ve already made payment, the PayPal email you received is confirmation that we’ve received your payment (no need to message me asking for ticket confirmation). This UPDATE has been emailed to the yes RSVPs. I hope to see you there! Every summer, I go river tubing down the Shenandoah and Potomac Rivers in West Virginia, a little over an hour away. 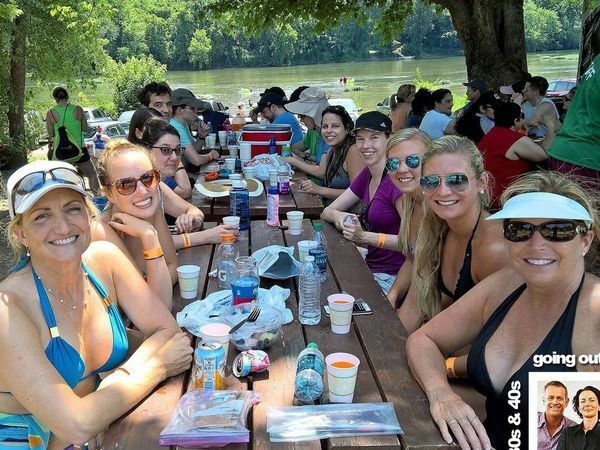 This tradition stems from my days at Virginia Tech, where tubing down the nearby New River was a weekly summer outing. There’s nothing quite like relaxing and floating down a river feeling the warm summer sun on your front, while being refreshed by cool water on your back as you lay nestled in your tube! 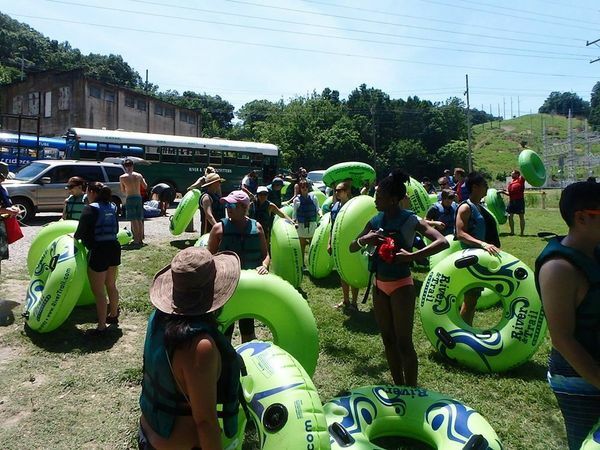 I’ve made special arrangements for our group to go river tubing near historic Harpers Ferry for a 1 – 2 hour long trip (depending on water levels). Plus, we are allowed to get back on the shuttle and go down again if we’d like. We’ll park our car where the trip ends, check in at noon, have lunch served to us, fill out waivers, and we’ll then be shuttled 1.5 miles upriver where we’ll splash and play through some small rapids before beginning our leisurely float down the river at 1:30pm. Dropping over shallow ledges along the foot of the Blue Ridge Mountains, we are sure to enjoy this mellow and beautiful stretch of river. Make sure to try the rope swing hanging from a tree on the right side of the river near the beginning of our float, and visit the little waterfall area on the left side of the river near the end of our float! I’ve reserved their picnic area with casual river seating, and lunch *is* provided for us. We’ll have a fried chicken picnic (veggie wrap can be substituted upon request… please see “Special Needs” section of the event posting for full details) with potato salad, watermelon, and a drink! Also, we are permitted to bring coolers with canned beverages (no glass please), and rent cooler tubes. No upgraded tubes will be permitted due to our large group size. We’ve got an early bird special for this event of $47 (lunch and all fees included)! The first 60 paid sign-ups, or those who pay by Sunday, July 22nd (whichever comes first) get the early bird price! After that, the ticket price will go to $54. We have a LIMITED number of spots so make sure to RSVP early AND make payment to secure your spot and get the early bird price! To make payment, please follow the steps in the “Payment” section of the event posting. 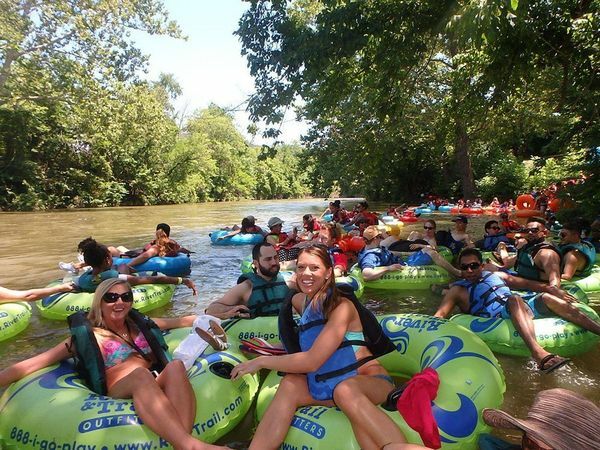 Come join us, tell a friend, and let’s have a fun, refreshing, and relaxing summer afternoon river tubing together! Please be on time. If you are late (arrive after the start time of 12pm, you risk the possibility of not being able to join us for some or all of the event. I will have a master list of all those that have paid. It’s not required, but I recommend printing out your payment confirmation email as a backup (if you are not on the list, you will be required to show it). When you check-in, your RSVP will be listed under the name of the PayPal or credit card account used to make payment. Typically, this is your LEGAL name as shown on your driver’s license. Sometimes, it may be under a company name if you set up your PayPal or credit card account that way. If you are not sure what it is, please log into your PayPal account (it will say “Welcome, [your account name]” at the top) or your credit card account to find out. If you are RSVP’d under someone else’s payment, please use that name for check-in. Similar to a concert ticket or a football game ticket, you are free to sell / transfer your ticket to someone else if you are unable to attend. I suggest posting in the comment box for the event, that you have a ticket for sale / transfer. Work out any payment between yourselves, and have the seller only send me (the organizer) a message through my Meetup profile (do not comment in the comment box of the event posting) letting me know the first AND last name, and Meetup profile URL (if a member) of the person taking your spot (please also copy them on the message). To obtain their Meetup profile URL, go to their profile from the mobile website or your computer (not the app), and copy & paste the URL from your browser. I host a lot of events and groups, so please let me know the event name and group name the ticket transfer is for. You must let me know by the RSVP close time of 8:30am on the day of the event. Note this location DOES NOT have a physical address, the location is not online mappable or GPS-able. If you are able to punch GPS coordinates into your GPS system, please use 39.291494, -77.787412. Some people have had success with 100 Millville Road, Millville, WV (it got them close). Others have said the address did not work with their GPS system (so use with caution). Otherwise, please use the directions below. Don’t forget to account for traffic delays. Take Exit 52 onto 340W toward Charles Town. Stay on Rt. 340 for 20 miles and follow over 2 bridges and into WV. Make a left onto Millville Rd. Follow straight, you will go over 2 sets of railroad tracks. Once you meet back up with the river you will see “Welcome to River & Trail” river access sign on the left (just over the 2nd set of railroad tracks). We’ll be in the parking “area” by the river. If it’s light rain, we’re still on. If there’s lightning, we’ll need to reschedule or cancel. Hopefully, if there is precipitation, it will just be a quick passing “summer” rain. If it looks like there might be possible rain, I’ll post an update by 9:00am the day of the event. If we cancel or reschedule, and you are unable to make the new date, you will get a full refund (please see the “Refund Policy” section of the event posting for full details).